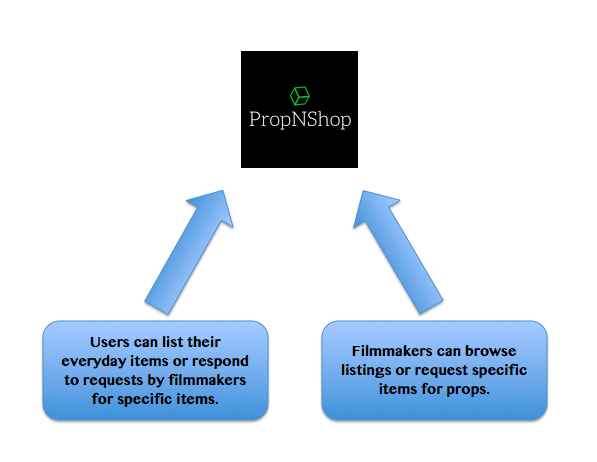 PropNShop connects filmmakers with people who want to rent-out their everyday items as movie props. Think eBay, but for movie prop rentals. Filmmakers on a budget need access to movie props at low prices. People with everyday items would love to make money from their items collecting dust. We solve both of their needs and desires with this app. Filmmakers are currently using Facebook groups and Craigslist ads, in addition to expensive prop rental companies, to find props. Prop rental companies like ACME Studio are potential competitors. People need a dedicated marketplace, specifically for movie props, where they can quickly and cheaply access the items that matter most. That marketplace does not yet exist. PropNShop is a consolidated marketplace for filmmakers to rent props quickly instead of renting expensive props or having to search for available props listed on a broad marketplace. We also help people rent and make money from their everyday items. PropNShop is a win-win for everyone. PropNShop will use a commission and featured listings model to generate revenue. Instead of charging a listing fee, PropNShop takes a small percentage of the rental price from the listing only if the listing is successful. Additionally, we will offer a “premium listing” option for users who would like more exposure for their items. Additionally, if a filmmaker decides to post a ‘request’ for a specific item and a user responds with that item and they agree upon a price, we take a percentage of the final transaction price.